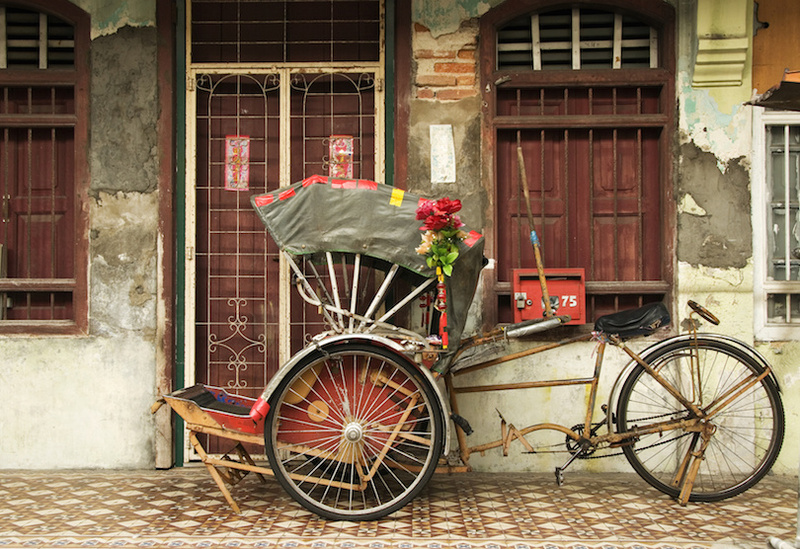 Malaysia is just the ticket for travelers searching for an adventurous destination. 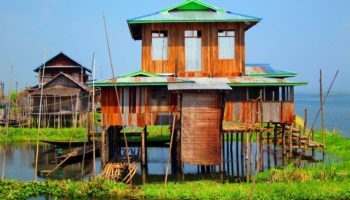 Located half a world away, this Southeast Asia country is exotic and fascinating. The food is delicious; the sights are spectacular. But don’t be surprised to find a spot of England here and there as this former British colony is part of the Commonwealth. This leisurely itinerary for 2 weeks in Malaysia takes in the highlights while allowing you to immerse yourself in a new culture. 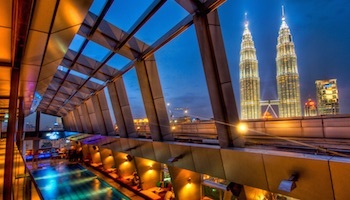 Start your visit to the national capital and most populous city in Malaysia by zipping to the top of the Petronas Twin Towers, at 88 stories high the tallest twin towers in the world. The views of a sophisticated Kuala Lumpur from its icon are nothing short of spectacular! Swoop back to earth from these dizzying heights to visit the Aquaria, with its thousands of marine life exhibits, and Kuala Lumpur Bird Park, home of the world’s largest free-flight zone. Since Islam is the country’s official religion, a visit to the Islamic Arts Museum, the largest in Southeast Asia, is in order. Fortunately, for your feet, the city’s major attractions are mostly located within walking distance from each other. The capital of Malacca state, Melaka City is one of the oldest cities on the Straits of Malacca. Once ruled by Portuguese traders, and then by the Dutch and British, the city is filled with pretty colonial architecture. 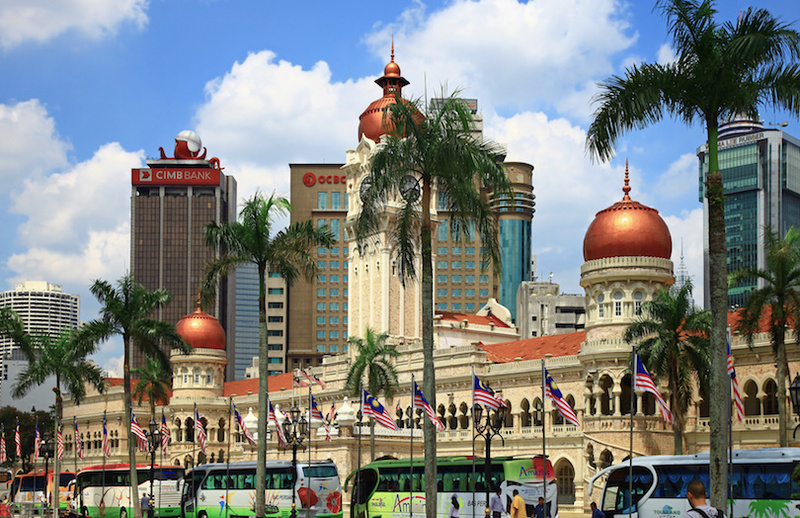 Its historic center makes it one of the most popular tourist destinations in Malaysia. Be sure to check in at Dutch Square to see Queen Victoria’s Fountain and Christ Church, the oldest Protestant church in Malaysia. Other sites include a replica of a 1502 Portuguese ship, the Tan Beng Swee clock tower and the famous Jonker Market, which sells just about everything under the sun. If you’re hungry, try pong the, a chicken and potato stew. 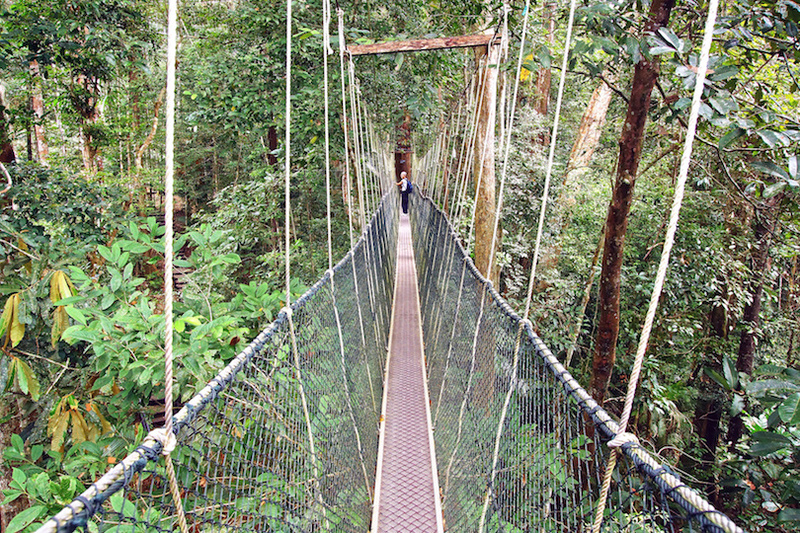 Taman Negara National Park is the perfect place to go to indulge your passion for the outdoors. Originally called King George V National Park, it was founded in 1938 to preserve this outstanding piece of Malaysian nature. Popular activities include hiking through one of the oldest rainforests in the world; taking a canopy walk, which allows you to get closer to nature, and boating on one of the park’s rivers. And always there is the lush foliage, including some large and rare flowers, and the wildlife. You probably won’t see elephants and tigers, but you might see monkeys, wild boars, reptiles, birds and insects. With a little luck you can even find a rafflesia, the world’s largest flower. 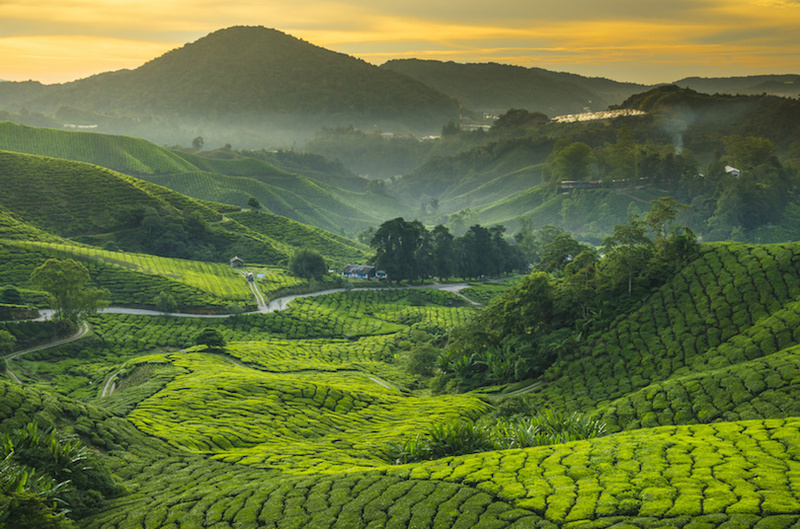 The next stop on your Malaysian adventure takes you from the jungles of Taman Negara National Park to the hills of the Cameron Highlands, the largest tea-growing region in Malaysia where foliage turning the hills a lush green. Tea has been grown here since the late 1920s, with tea plantations being a popular tourist draw. The highlands are the highest point in Malaysia accessible by road. The region has eight small towns, the largest being Tanah Rata A good place to see the highlands is from the observation tower at Mount Brinchang. You’ll also want to walk through the Mossy Forest, where centuries-old trees are covered in moss. George Town, the capital of the tropical island state of Penang, is another historic city filled with colonial architecture. 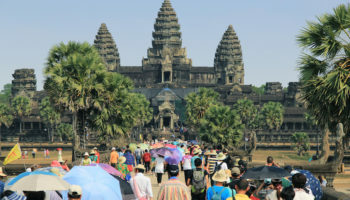 This is a good place to just wander with its busy streets and intermingling cultures, with its healthy mix of ancient, traditional and modern. 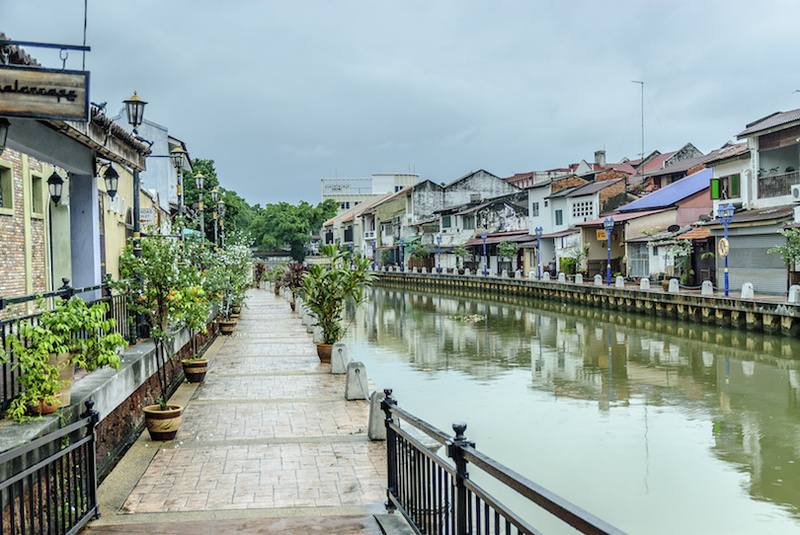 You’ll want to walk the Penang Heritage Trail, especially through the Clan Jetties in Chinatown. The city has several outstanding old temples and mosques. 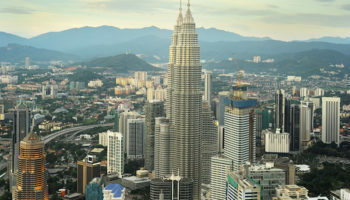 With five different cuisines, this colorful city is famous throughout Malaysia for its food, especially street food that is labeled the best in Asia. A popular Penang street snack is char koay teow (stir-fred rice noodles). End your Malaysian adventure with a visit to Langkawi, an archipelago of 104 beautiful islands about 32 km (20 miles) off the mainland. Known as the Jewel of Keddah, Langkawi is a good place for water activities such as beachcombing or jet-boating through the islands. Landlubbers may want to tour Kilim Karst Geoforest Park, where you can swim and see crocodile caves (not at the same time, though! 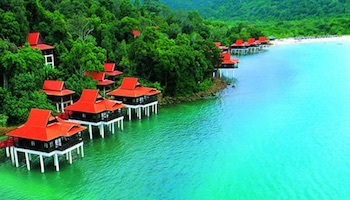 ), or ride the Langkawi cable car for panoramic views of sea and forest. 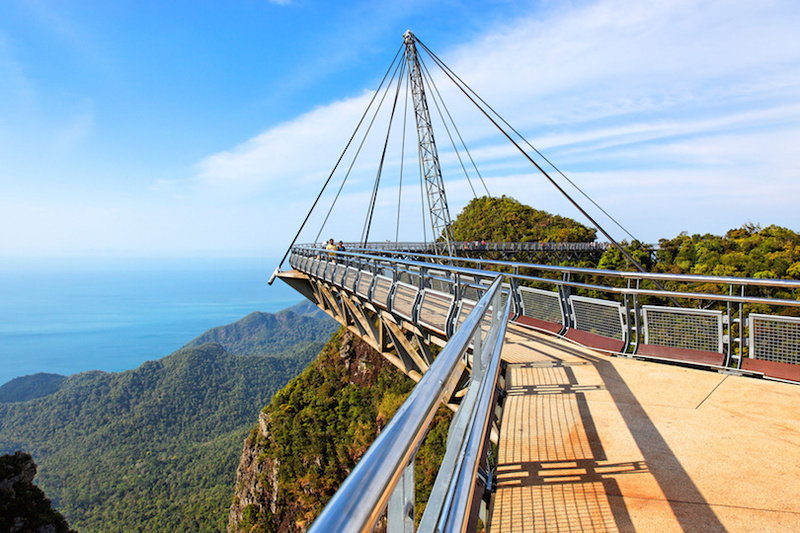 The Langkawi sky bridge also offers stunning views. 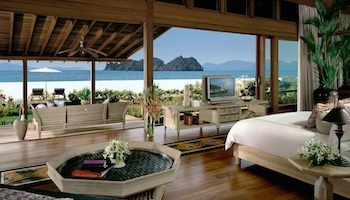 Or you just might want to relax on one of the many gorgeous beaches after your 2 weeks in Malaysia adventure. These images are incredible, did not know that Malaysia had so many beautiful places, travel must be expensive but certainly worth.